Find a parota chef, become his apprentice and learn the art of making a parota. If you have suggestions on other things I can do while I am in India, do leave a comment, and I will add the interesting suggestions to the list. Happy 61st Independence Day Everyone, and enjoy the wallpaper. All images used in the wallpaper were found on flickr. 2007 was a memorable year both for me and the world in general, especially in the way the green revolution has taken off. However, it was a slow year for this blog. Even though, as an optimist, I am looking forward to a great year in 2008, and looking forward to sharing more of my thoughts and views on this blog; I feel 2008 might be a very challenging year. This could be a year where we face more issues related to our destruction of the environment, more extinctions, more global conflicts along the lines of religion and race, and more economic turmoils due to a degrading dollar and shift of economic growth from west to east. But, I hope everyone can come together, think and work as one, to solve problems which are common to all of us, and make it the year humanity decided to make a quantum leap. I wish all of you a 2008 which is not just about happiness, but about making revolutionary changes. Enjoy the wallpaper and Good Karma! When it comes to milestones, sushtipurthi or completion of 60 years, is special in India. 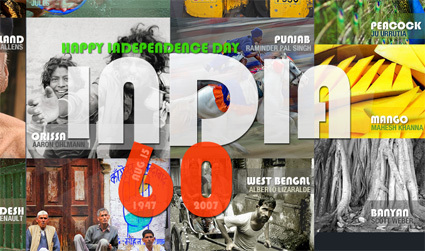 Today, India has been independent from its brutal colonial rule for 60 years. In the grand scheme of things it’s a small time frame in contrast to a region rich with traditions, religions, languages and history whose lineage dates back thousands of years. But from our frame of reference, 60 years back; regardless of all our internal tussles and disagreements on various fronts, we have held ourselves together and are moving forward in gargantuan strides. However, 60 years later, as we emulate and toil to be at par with developed nations, the real India seems to lurk in the background, whether knowingly or unknowingly, safeguarding the identity that makes us who we are. That real India of my childhood, that real India my grandfather–Marthandan Narayanan–fought the British on the battle fields of Rangoon for, and that real India which still exists in its numerous villages and towns. A moment comes, which comes but rarely in history, when we step out from the old to the new, when an age ends, and when the soul of a nation, long suppressed, finds utterance. It is fitting that at this solemn moment we take the pledge of dedication to the service of India and her people and to the still larger cause of humanity. 60 years since Nehru spoke those words, it seems we are at another junction, where we step from the old to the new. 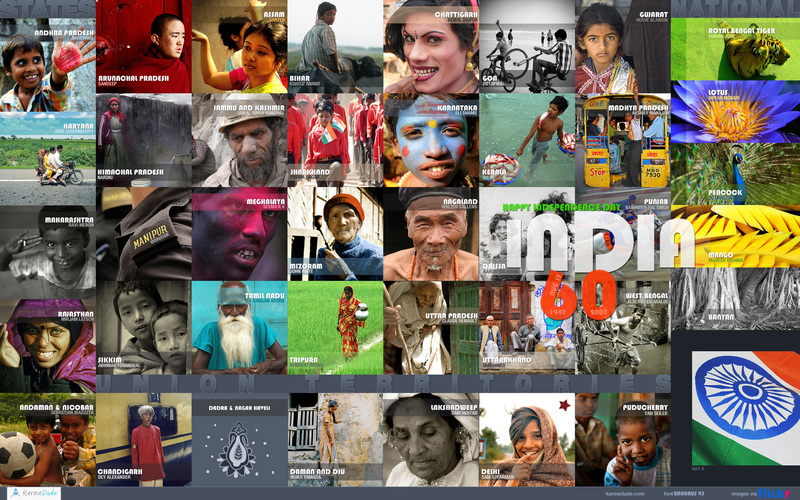 Maybe 60 years from now that real India might not exist anymore; so for this 60th Independence Day, I have put together a wallpaper of images of people from all parts of India, in a way trying to see the real India in the faces of its people. Happy 60th Independence Day Everyone, and enjoy the wallpaper. All images used in the wallpaper were found on flickr. The only place I could not find a photo for was Dadra and Nagar Haveli. I would like to thank the following photographers for having taken such striking images of India and its people, and especially for sharing and granting me the permission to include their images in this wallpaper. There are 40 photos used in this wallpaper, and I have 32 approvals for image use. For those photographers I haven’t heard back from, I apologize for jumping the gun and releasing the wallpaper prior to receiving consent, as I had to get it out today. If you have an issue with your image being in the wallpaper, do let me know and I will remove it immediately. I was playing with blender, and here is one of the backgrounds I created for fun. Looking through the site stats, I just realized that this site has been nominated for 2006 Indibloggies under—Best Designed Indiblog—Wow! That is definitely a first and very humbling indeed. Being up against the likes of Chugs and Megha, I am probably the unpopular underdog here, and so I am just going to be happy with the nomination. However, do check out some of the interesting and popular Indian blogs that are nominated and if you feel like it vote for your favorite blogs. As for those who are new to the blog, welcome! Take a look around, and maybe you will find something you like. You have probably noticed a lack of posts for that last few weeks. On November 1st, the server this blog and two of my other blogs were hosted on went down. This resulted in loss of data, and the last few weeks I have been busy moving all the three blogs (counterjumper, scroller) over to Media Temple, and recovering some of the lost data. The blogs are all back up and running now, and most of the data was recovered from my personal backups and search engine caches. A few user comments have been lost, and I will try and recover those in the next few days. You will also notice that the Inner Sanctum link has been removed. I was not happy with Vanilla, the forum software I was using. I will be bringing Inner Sanctum back in a few weeks, once I have installed and setup bbPress. Let me know if you find any issues with the blog. Regular blogging will resume shortly. 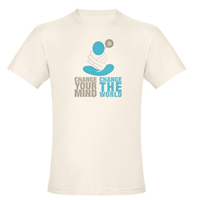 OM T-shirt printed on an Organic Cotton T-shirt. Copyright Liji Jinaraj. All rights reserved.